But there are things I do on my phone that are meaningless, and sometimes I find myself doing them like a robot in a trance. I'm looking at you, mah jong games. I will sometimes even split my focus, playing a game or reading an article while also watching TV. Or worst of all, talking to someone in person while checking Instagram. UNICEF is the United Nations Children's Fund, and they work in many nations to provide access to clean drinking water and sanitation. We take for granted in this country that we have clean water - the most basic need that we have. I fill my water bottle at work and home countless times every day - it's the primary beverage I drink. I take a shower with clean water every morning and wash dishes and clothes with clean water without thinking about it. 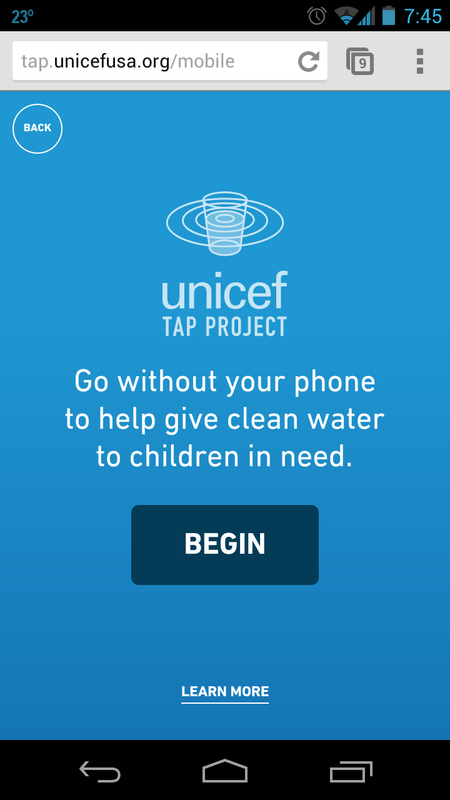 After 10 minutes, you've given a child a day's worth of clean drinking water. While I did mine, a few facts popped up on the screen before it went dark and one of those were that 4 people were going without their phones at the same time in Pennsylvania. 4 people? That's pathetic. We can do better than that. The next time you pick up your phone, think about how blessed you are to even have a phone to use. Think about how there are millions of people in the world today who don't even know what a smart phone is because they are too busy trying to get clean water to drink. this is great i can't wait to show my friends.